Bloomsbury New Harry Potter Covers and Artist Interview! 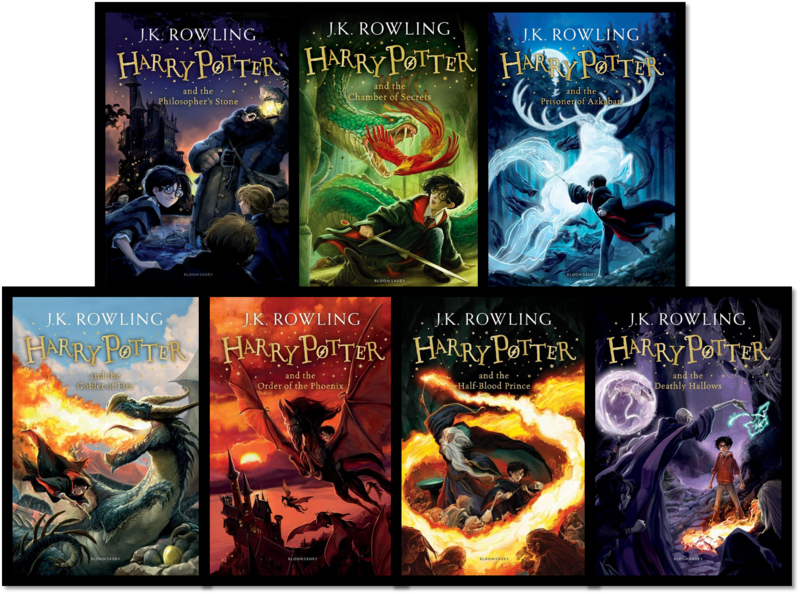 Bloomsbury Children’s Books are set to reinvent the children’s hardback and paperback editions of my beloved Harry Potter series! I own the original Bloomsbury covers and they have always been my favourite, but I wanted to re-purchase the series to preserve my original copies (and, OK, because my original set doesn’t match either, it’s half hardback and half paperback…). 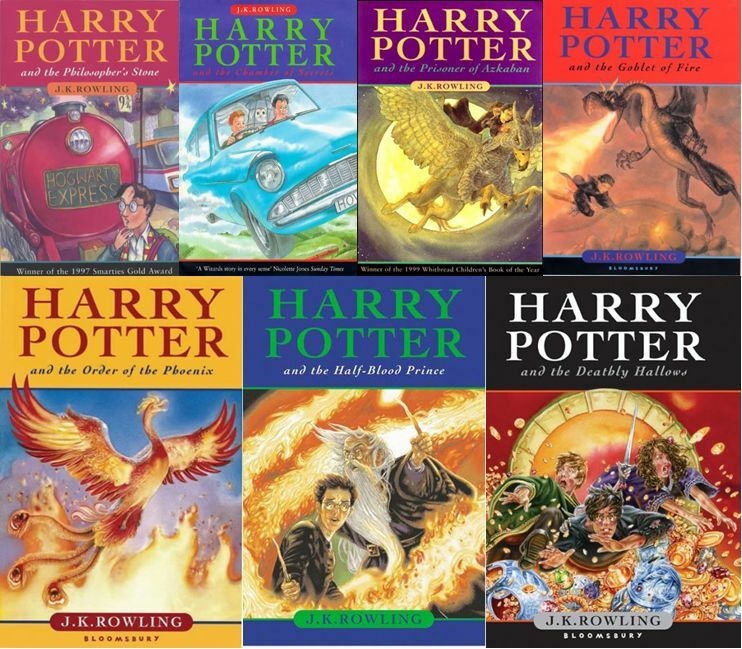 I originally wanted the Scholastic Anniversary Edition (I wanted it bad) but I realised they are American Editions, which among other things mean the first book is Harry Potter and the Sorcerer’s Stone, and I’m sorry American readers, but I just can’t handle that. The new Bloomsbury series is being redesigned by award-winning artist Jonny Duddle – and I LOVE the artwork. I think this might be the set for me! Along with the brand new artwork and an updated author biography, the new editions will also be reset to create a child-friendly reading experience (I’m not sure what this means exactly, but I’m dubious! Super-big text, maybe?). The titles will also contain highlights from Pottermore, the digital platform for Harry Potter (where I still can’t get past the potion making class and where you can read the newly released Harry Potter sequel!). All titles will be published on 1st September 2014. 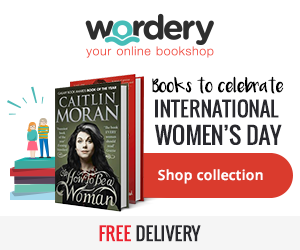 ‘I’m hugely excited to work my way through the wonderful books. I couldn’t have asked for [a] more enjoyable subject matter. It’s exciting, daunting and I feel the weight of responsibility, and I’m just hoping that my illustrations faithfully reflect the characters and world created by J.K.Rowling’. How did you feel when you found out you would be illustrating the new Harry Potter covers? It was a bit of a shock. I painted the first cover as a “test” piece last year, but was concerned that I couldn’t give it the time I would’ve liked due to other commitments. So when I heard that J.K. Rowling and the team at Bloomsbury wanted me to paint the rest of the series, I was gobsmacked. And then I worried that I just wasn’t qualified for the job, having only read the first book years ago. I felt like an impostor, amongst millions of Harry Potter fans. A proper Muggle. But then I realised that this gives me a fresh perspective, and I’m hugely excited to work my way through the wonderful books, reading each one as I produce artwork brimming with fantastic creatures and unforgettable characters. Is there a particular character or scene that you are looking forward to putting on the jackets? I’ve been briefed on all of the jackets, and in most cases I’ve been given a couple of options. I haven’t actually read all of the books, so I can only be excited by what I’ve read, or the brief for each cover. I’m working on the cover for The Prisoner of Azkaban at the moment, and I’m having a lot of fun drawing a key element of that book. I love drawing characters, creatures and animals, so every cover gives me scope for something new and exciting. As an artist, how do you approach such a large job? Where do you begin with such a wide range of possibilities? I’m taking one book at a time. I read the cover brief, and then I read the story, making notes and occasional sketches. I collect references, from my library of non-fiction books, search online and take my own photographs. I’ve recruited my neighbour’s son, who is suitably Potter-eque, although he annoyingly had his slightly wild hair cut for the new school term. I make numerous sketches of the main elements of the cover and then cobble them together digitally, until I have a rough cover I feel happy to send to Bloomsbury and J.K. Rowling. I hear back very quickly with comments on my rough, which I then tweak or redraw until everyone’s happy for me to progress. Then I “paint” each cover digitally. Are you a Harry Potter fan? If so, what are your first memories of reading the books? I am now very much a Harry Potter fan. I read Harry Potter and the Philosopher’s Stone a few years ago, and I bought a boxed set with the intention of reading all the books. But I’ve had a very busy few years with my career as an illustrator and writer and, along with a young family and late nights in my studio, I just don’t read as much as I would like, and nowhere near as much as I used to. And as a country bumpkin with no cinemas nearby, I’d never seen the Harry Potter films. I saw the first one at the cinema, after I read the book, but that’s it. In some ways that probably makes me unusual, and I think that’s a good place from which to approach the world of Hogwarts and Harry Potter, without any preconceptions. I’m reading each book in turn and immediately developing the cover, taking the images that are conjured up in my head by J. K. Rowling’s magical words. Who is your favourite character from the Harry Potter universe? I love Hagrid. I like his bumbling, well-meaning nature and how things often go wrong because of something he’s said or done, or his general clumsiness, in spite of his best intentions. In that way, he reminds me of myself. When I was briefed on the first cover, he was the first character I tried to draw. I also like Arthur Weasley because he likes tinkering with old cars (like my dad used to), and I like his approach to his job at the Ministry, as a slightly naughty and mild-mannered rebel. As a very young child it was Where the Wild Things Are by Maurice Sendak. Then I was obsessed with Roald Dahl, and I’m still in love with his books, having just finished reading all of them with my eight-year-old daughter. As I got older I became a bit of a fantasy nut. I started high school in 1981, and was a huge fan of the new ‘fighting fantasy’ series, beginning with The Warlock of Firetop Mountain. I remember mapping out the book on a long roll of printer paper my dad brought home from work, and painstakingly copying each illustration from the book on to the map in the appropriate location. I read The Hobbit in my last year at primary school, which is still one of my favourite books, and then The Lord of the Rings in my first year (or two?) at secondary school. I felt a connection with J.R.R. Tolkien’s work, because the environments of Middle Earth seemed to echo the environments in which I grew up and explored on my bike, amongst the hills that form the border between England and Wales, with the rolling valleys beneath and the dark, foreboding peaks of Snowdonia visible in the distance. Who are your favourite illustrators (either classic or modern)? I’m an avid collector of books, and now have hundreds weighing down the sagging floorboards of my studio. Going back to my favourite book when I was little, I’m still inspired by the late Maurice Sendak, and was blown away by the documentary Tell Them Anything You Want, in which he talked about his life and inspirations. The first illustrator I remember being directly inspired by was Brian Froud, after watching a piece on television whilst on holiday in the Lake District when I was ten years old, about his development process on The Dark Crystal. As a student I obsessed over the Golden Age illustrators, in particular Arthur Rackham, Edmund Dulac and W. Heath Robinson. I also enjoy independent comics and I loved Jamie Hewlett’s work on Tank Girl, and everything he’s done with Gorillaz in recent years. Modern favourites are diverse, from children’s book illustrators like Shaun Tan and Chris Riddell, lowbrow painter Glenn Barr and a host of movie concept artists (and illustrators) such as Peter De Seve, Nico Marlet and Carter Goodrich. How would you describe your own art style? I think I have a number of ‘styles’. The illustrations I’m creating for Harry Potter are very different to the artwork in my picture books, which are probably what I’m best known for. Before becoming an Illustrator, I worked for eight years as a concept artist in computer games, and I recently spent almost four years working with Aardman, as one of the character designers on their stop-motion movie The Pirates! In an Adventure with Scientists! As a concept artist you have to be thick-skinned, as drawings are tossed aside with barely a glance form your Art Director, and open-minded with style and subject matter. I worked on games that were cartoony, realistic and sometimes almost abstract, producing thousands of drawings in pencil and on computer whilst developing a digital toolset that’s been carried over into my illustration work. On computer, I work in a very similar way to my techniques with real paint, progressing from a sketch to a finished drawing, laying an under-painting and then working on a final layer of colour. I love the flexibility that digital artwork gives me to change the direction of a painting and move elements around at any stage. The common threads, however stylised or realistic, are probably my desire to emphasise character, drop in some vivid colours and a tendency to cram as much as I can into an illustration. These work well in my picture books, but often have to be tempered a little with book jackets, particularly for older readers. You are well-known for your picture books. Is it easier to come up with ideas for a full book or a single jacket? My picture books evolve over many months, or sometimes years, with the words and pictures feeding each other until an idea becomes more solid. I only illustrate my own picture books, so the writing is intimately connected to the artwork and a book idea might stem from a single sketch or a single sentence. The illustrations can’t be ‘wrong’ because everything’s coming from me. Creating an illustration for a book cover is very different. It involves reading some else’s story and trying to understand their vision, so in many ways that can be more difficult. And with Harry Potter, the scenes I’m illustrating have been illustrated before, dissected, discussed and analysed by millions of fans, and made into incredibly successful movies. I’ve not been party to everything that has come before, so I’m creating my interpretation of J.K. Rowling’s words. Hopefully, my illustrations will find new fans, readers will enjoy them and be attracted to them, and I will bring something new to the Harry Potter universe. What tips would you offer to young people who are keen to become artists/illustrators? I think anyone can become an artist or illustrator. I don’t believe in ‘talent’ in art, just the desire to practice. If you practice every day, you’ll get better every day. The younger you are when you start practising, the sooner you will begin to feel confident in your abilities. There is such a wonderful diversity in children’s book illustration today, and a few hours in a bookshop or library can reveal artists working in all manner of styles, techniques and mediums. If you find a selection of artists you like, study their work and try and create something similar you can learn a lot. Most of the artists I’ve met and admire are never particularly happy with their work, and are constantly experimenting and striving to improve. Being an illustrator is the best job in the world, but also one of the hardest jobs in the world. Drawing and colouring-in is actually really difficult, even for professional artists, and you can spend whole days getting nowhere. But the more you practice, the better you get and the more comfortable you get with your own artistic voice. Do you have a daily routine when it comes to illustrating? My daily routine is constructed around my two young children. My wife leaves for work at 7.30am, so first thing it’s toast, porridge and packed lunches, then school uniform and sparkly-teeth inspection, followed by the school run, before I can get into my studio. By ‘school run’, I mean ‘running to school’, because my eldest daughter wants to be at the front of the line in the playground and I have to chase after her to give her a kiss on the cheek. We live in a very small village in North Wales, so the school is only fifty yards away and with my studio window open I can hear the children playing outside. I try and take a walk down the lane at lunchtime, which is often the perfect time for inspiration and mulling over the day’s artistic problems. I work until I have to pick up the girls, which can be anytime between 3.00 p.m. and 5.30 p.m. Then I’m usually back at the drawing board once I’ve read some stories and the children are fast asleep in bed. This post was inspired by Leah @ Uncorked Thoughts Cover Reveal. The interview was from a Bloomsbury Press Release. I will always adore the original UK children’s covers the most because they *are* Harry Potter, to me. But those new ones are beautiful too, very well done (better than the original US covers imo as well!). I didn’t know they would contain the new stuff from pottermore though- that thought makes me want to buy them when they are released! Oh, my! I’m drooling over those new covers!! I am totally not a book “collector” but I feel the need to give away my current HP set just so I can buy these new ones. 🙂 Of course, I’m American, so I’m totally used to that Sorceror’s thing – I didn’t even realize the title was changed! I’m obviously not an avid enough HP fan.